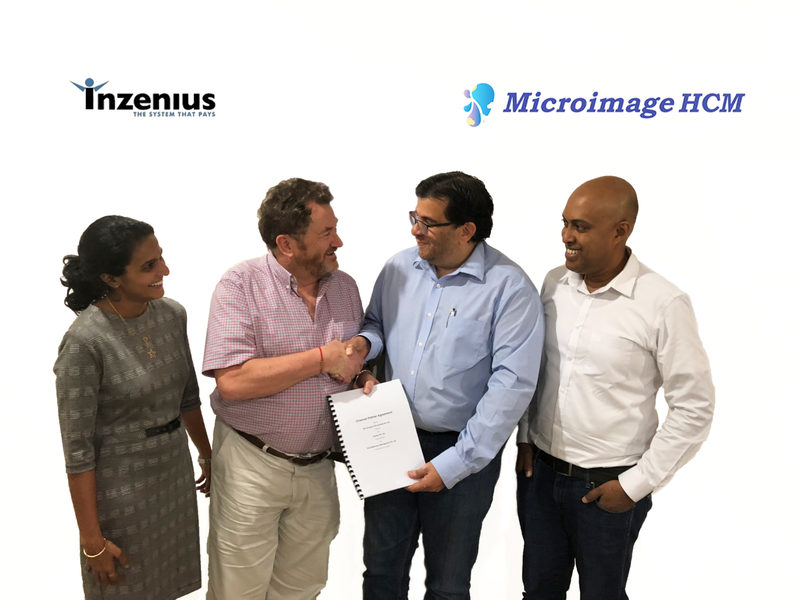 Inzenius Australia and New Zealand partners with Microimage HCM to extend their Payroll solution with a full cloud based HR product offering. Inzenius Australia a leading innovative provider of Payroll & HR solutions for Australia & New Zealand recently partnered with Microimage HCM to extend its product offering to include full digital HR. This partnership allows Inzenius to offer a complete suite of Digital HR products for their clients and future prospective clients. Microimage HCM & Inzenius teams have developed seamless integration to their respective products which has enabled the Inzenius Payroll to be fully integrated to Microimage HCM Cloud which offers clients a friction free experience. Russell Bode, Founder/CEO of Inzenius recently visited Microimage’s R&D center in Colombo, Sri Lanka to ink the partnership together with Microimage Australia Director of Business Development – Peter Wijeyaratne. Inzenius is a leader in offering fully compliant and single touch payroll (STP) in the Australian market. They have an extensive client portfolio particularly in the services and hospitality sector. They have built a rule based sophisticated payroll engine over the years which can be tailored easily to a client’s complex requirements. The Partnership with Microimage HCM extends that reach into a foray of HR functionality ranging from onboarding, offboarding to comprehensive recruitment and talent management. During his visit to Microimage office in Colombo Russell had extensive meetings with various Microimage teams to plan future go-to market actions & joint research & development. “It was after a long process of reviewing best of breed HRM platforms in the world that Inzenius finally selected Microimage as their partner. The decision was made due to many factors including, Microimage having the most complete HRM offering, built on a scalable cloud based platform, with an organisation that is focused on the continuous developments that exploit the latest robust technologies. Microimage and Inzenius joint offering ensures that customers can maintain and grow the digitalization footprint of their HRM and payroll processes with a structed process of adoption over time” said Russell Bode, Founder/CEO of Inzenius. Microimage HCM entered the Australian market last year and was building its partner ecosystem over the last 12 months. Microimage found Inzenius to be a strategic partner to jointly help organisations move from legacy HR practices to digital HR. “This is an exciting opportunity for Microimage to extend its reach in the Australian and New Zealand Markets with an established partner who is experienced with local conditions” said Peter Wijeyaratne, Director/Head of Business Development – Microimage Australia. “Russell’s visit to our R&D center enabled us to have strategic discussions on formulating go to market actions for the future. We see an exciting future ahead for both companies as we have successfully integrated both products to work together. We look forward to taking this partnership to another level commencing 2019” said Harsha Purasinghe, CEO of Microimage HCM. “Inzenius is a strategic partner as they already have a substantial customer base in the HRM field. I am delighted to welcome Inzenius to our partner program, and I am confident that this partnership will reap great benefits for both companies” said Himashie Perera, Head of Global Partner Program for Microimage HCM. Microimage HCM Cloud is an enterprise-grade HR solution delivered with a modern consumer-grade user experience, providing talent insights for timely and accurate decision-making using advanced analytics and natural language query functionality. Native mobile apps for iOS / Android help empower a mobile-first workforce and the platform also helps enhance employee engagement with collaboration, social and feedback capabilities. HCM Cloud is powered by secure, scalable and stable Microsoft Azure cloud and is currently deployed in the UK, Asia and Australia Azure Data Centers. Microimage HCM is a leading IP Co-Sell ready ISV of Microsoft Corporation. Microimage works closely with all Microsoft offices across Asia Pacific region.